Spidey and Cheese pose for a picture. Cheese, glamous Cheese posing in front of the Hollywood sign. Spirit Duck poses with Gabriel Macht who plays “The Spirit” character in the movie. The Spirit Duck poses on the red carpet before the movie. Have you ever wondered what a Duckie Olympics would be like? No. Well, that is why Duckshow exists….we go there….with rubber ducks! Two duckies paddle it out for the gold in table tennis. A gold is awarded to Duckathon in track and field. And finally-two ducks are awarded a gold for synchronized swimming. They even synchronized their pose for the picture! Now that’s dedication! Street Duck makes sure the coast is clear after leaving his mark. 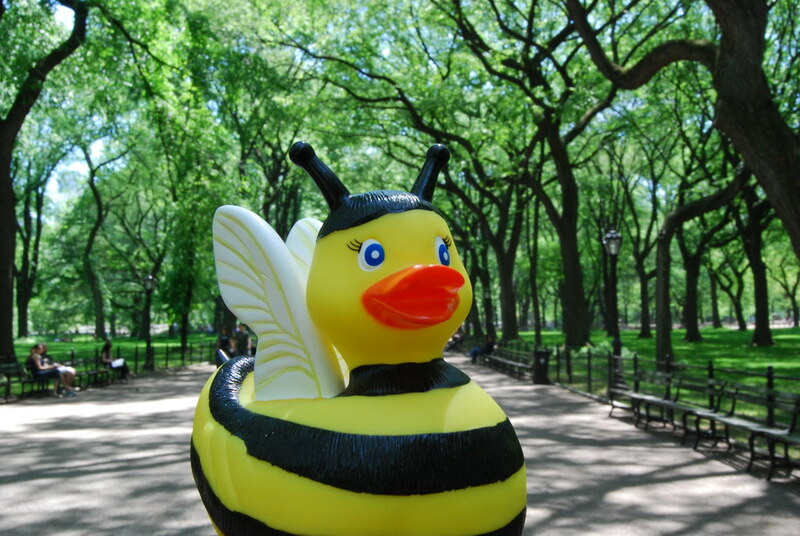 After a long winter the weather suddenly got nice out, so the ducks decided to waddle through Central Park today. This weekend the ducks went out to celebrate National Tartan Day. The first thing they did was head over to the Haggis cart for a snack before the parade. Before the parade Seumas warms up with some other pipers. And Scotty gets a picture with a fellow Scotsman.